A free utility tool to view, edit photos, Images in Windows 7. This Article Has Been Shared 2067 Times! Install custom themes in Windows 7 by using Universal ThemePatcher with EASY steps! Free Screen Shot Capture Tool iCapture for Window 7 is a screen shot taking tool with lot of features and nice GUI. Hanging Glassy Shortcut Widgets runs on XWidget Engine. Amazing part is they can be used as shortcuts to useful default shortcuts like My Computer to any Third Party Softwares. Ivory Glass Dock is an excellent quality realistic dock which is created for Rocket Dock. Smooth effects makes it a desktop collectible. 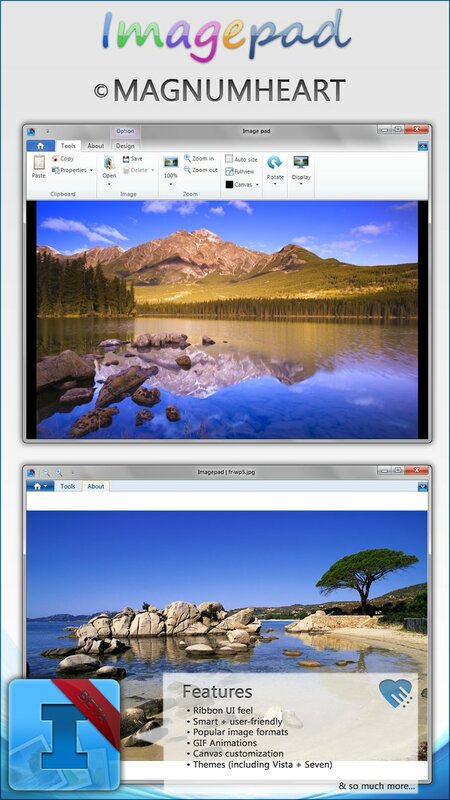 Cite this article as: Abhishek Ghosh, "Imagepad," in The Customize Windows, October 30, 2010, April 21, 2019, https://thecustomizewindows.com/2010/10/imagepad/.